Go, Tracy, Go! 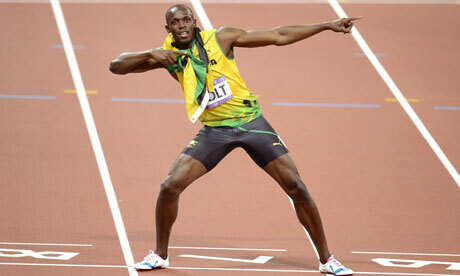 : Who would run a faster marathon: Usain Bolt, Lance Armstrong, or Derek Jeter? Who would run a faster marathon: Usain Bolt, Lance Armstrong, or Derek Jeter? The funniest thing happened to me yesterday: I woke up in the morning, made myself breakfast, watched some tv, went out for a walk and then lunch, watched some football, did some work, emailed a couple of friends about running. Do you notice there what I didn't do? But that's not my question, and I have a pressing one today. My question is: which non-distance running professional athlete would win in a marathon? I have a friend who follows Formula 1 racing. One of his assertions is that the drivers are in impeccable physical shape. Okay, I'm with him so far. However, where he loses me is in trying to compare across sports. Fitness for cycling or for (auto)racing or for sprinting, even, is all different and each requires different aptitude and (most importantly) different training. Am I right? Any excuse for a shirtless Frank Shorter picture. I mean, Lance Armstrong said that running a marathon was the hardest thing he'd ever done. And when you compare pictures of elite distance runners against elite sprinters, it doesn't take much to see that they are physically different. Those thighs. They are substantial. But I'm still mulling this over in my head. How far does natural athletic ability take you versus sport-specific training? How well could a super gifted athlete do were s/he to switch sports and train, in earnest and over a period of more than 18-weeks, for a marathon? Update: I can't figure out how to embed it, but here's a former NFLer talking about how much he prefers to watch track over football. Not exactly relevant, but I feel some vindication. Lance ran the 2011 NYC marathon in 2:46, which I'll admit, is pretty impressive. I'm not sure in 18 weeks Jeter or Bolt could beat him. Lance naturally has the endurance, and I honestly think in such a short time Bolt would be able to run that fast for that long. Sounds like a good challenge though! But wasn't the challenge MORE than 18 weeks, i.e., they effectively have to become a long distance runner? I still think Lance would win if we're talking Lance, Jeter and Bolt. He's all slowtwitch, and Jeter and Bolt are both in sports that call for short bursts of power. Who else would run a crazy respectable marathon time? I can't even think of any athletes, male or female, who fit the runner type in such a way that I would assume they could run a smoking hot marathon. Lots of sprinter types, few endurance types. I think Mike Richter, (formerly) from the NY Rangers ran NYC a few years ago, but I have no idea how he did. Natural athletic talent counts for a lot, and I think there is a significant amount of athletic crossover regardless of how different the two sports are. Derek Jeter is like 137-years-old and hardly ever runs more than 90-feet at a time, so he'll never run a 3-hour marathon. But if he trained seriously for the 18 weeks you propose, he would finish quite high in his age group because he's a natural athlete. This is also why so many pro athletes have won Dances with the Stars. In my head, Derek Jeter is always about 27 years old. I was getting all ready to be faux-upset ("You think he's 137? How old do you think *I* am?") when I looked his age up - he's 38. Damn. He's older than me. By a few years, even. Drugs haven't hit the distance running community... yet, anyway. I don't think. But yeah, that's an interesting point: if just slightly sub-3 is the best Lance can do DESPITE doping, hm. Did you see this in the NYTimes today? Jenson Button ran a 10k in 35:30 . When he ran a 70.3 IronMan, he came in 3rd. Jenson Button won the F1 championship in 2009. To be fair... it was an age group victory. But I have a new marathon goal: beat his girlfriend's time (which is about 4 minutes off my PR).